Few things capture the imagination like an imposing medieval castle towering from an even more imposing mountainside. South Tyrol has no shortage of them. The region swells with 800 castles and mansions spread over a variety of its Alpine and Mediterranean landscapes. In fact, more castles loom from this corner of northern Italy than any other area of Europe. 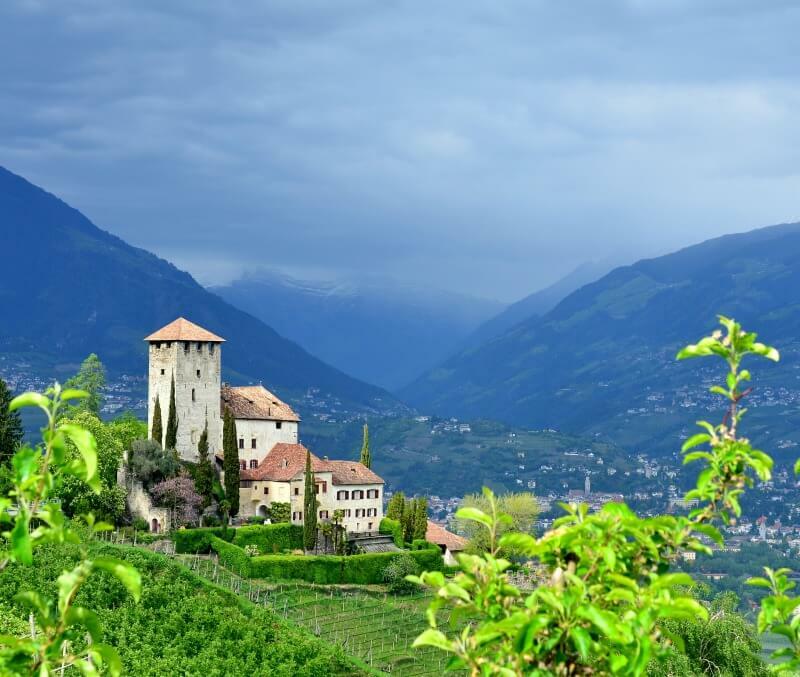 Surrounded by vineyards, orchards, forests and hiking trails not to mention some of the most stunning mountain scenery in the world, South Tyrol’s castles provide a truly breathtaking way to plunge yourself into the Middle Ages. You don’t have to be a kid at heart or a fanatic of Games of Thrones to find these fortresses fascinating. Here are some celebrated South Tyrolean medieval haunts you’ll want to visit. 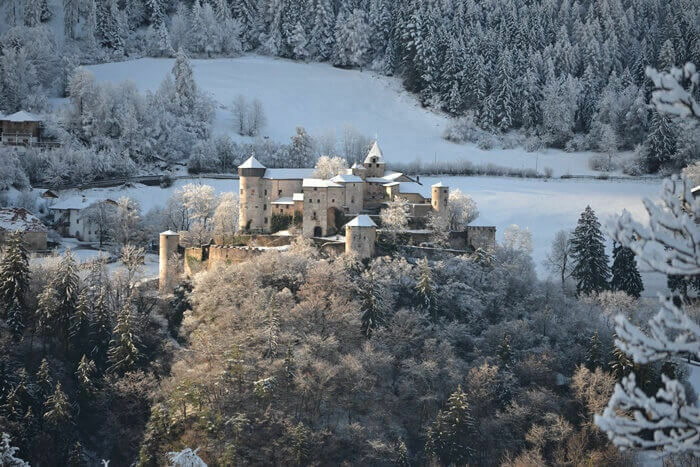 Perhaps the most important castle in South Tyrol, Castle Tirol rises over a deep ravine in the village of Dorf Tirol. This riveting fortress was such a force in medieval times that it cast its name upon an entire land. From its ramparts, you’ll cast your eyes over sweeping views of apple orchards, terraced vineyards and the unfurling rich greenery of the Etschtal valley. Picturesque even in the gloom of November. Many of South Tyrol’s castles, like Castle Tirol shown here, tower from rocky spurs erupting out of forested mountainsides. Built in the 1100s, Castle Tirol was home to the Counts of Tyrol and wielded enough influence throughout Europe to earn ink in Dante’s Inferno, the epic poem first published in 1321. The Tappeiner Promenade, Algunder Waalweg (a path along an ancient water channel) and Falconers’ Path (Falknerweg) wind around the castle presenting countless photo opportunities. Plus, a perfectly positioned beer garden nearby entices you to sit and savor the sights with a refreshing beverage in hand. The sweeping mountain and valley views from Castle Tirol make it well worth the hike to reach it. The castle is the perfect place to discover the history of South Tyrol as it also contains the South Tyrolean Museum of History. Spread out through several floors in the castle’s chief tower, the museum reveals a new era of South Tyrol as you walk up. Taking the time to soak in the marvelous past of the region is a must when visiting the castle. 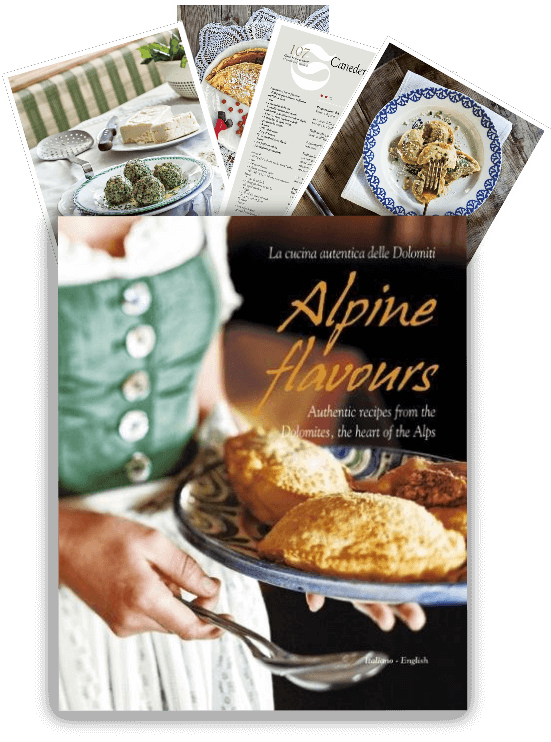 During the holiday season, Castle Tirol also hosts a cozy Christmas market within its courtyard. Visiting it at this time of year is especially endearing as the castle imbues all who enter with an undeniable Christmas spirit. Castle Taufers is one of the largest castles in South Tyrol. Staring up its stone walls chiseled with medieval brawn, it’s hard not to conjure up thoughts of Ned Stark boldly commanding from the castle’s throne room. Fortunately, you don’t have to be on the set of Game of Thrones to walk through its knightly halls. Castle Taufers attracts around 75,000 visitors each year. Castle Taufers was residence to some of South Tyrol’s most powerful aristocrats of the 13th century. History abounds within. The castle boasts 64 rooms many of which are ornately decorated with paintings, chandeliers, intricate woodwork and weapons. Castle Taufers watches over the village of Campo Tures in the far east corner of South Tyrol. 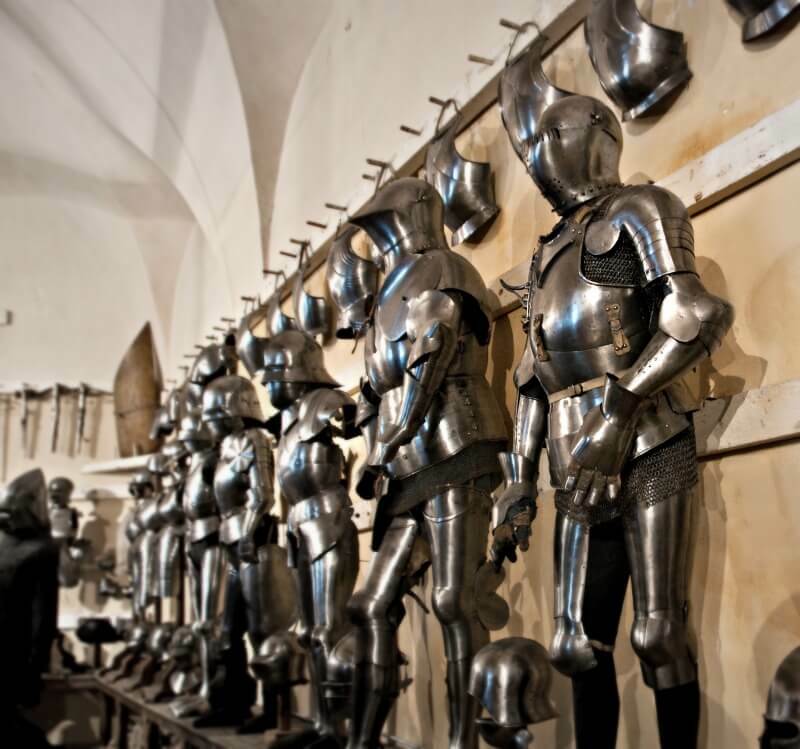 Among the most fascinating rooms are the torture chamber, the hall of knights, baroque library and the weapons hall. The castle’s Romanesque chapel captivates crucifix from around the year 1200. The chapel also showcases striking Gothic frescoes from 1482. With its formidable appearance, it’s no surprise the Taufers Castle has found its way onto the silver screen. The castle served as the haunting backdrop to Roman’s Polanski’s 1967 horror classic: The Fearless Vampires, which starred Sharon Tate. Enthroned on a thundering mountainside above the Isarco river, the Trostburg Castle was the stalwart gatekeeper to the Val Gardena for centuries. The fortress, forged from stone around 1150, offers admirers a deep glimpse into life during the Middle Ages. It was the childhood home to Oswald von Wolkenstein, an esteemed poet celebrated as the last Minnesinger of the Medieval Age. Interesting enough, the person often regarded as the first Minnesinger also came from South Tyrol: Walther von der Vogelweide. The cantina at Trostburg Castle reveals how wine was made when kings and queens ruled from a throne. Trostburg Castle houses the South Tyrolean Museum of Castles where you can view with 86 true-to-scale models of castles throughout South Tyrol. This makes Trostburg an ideal castle to visit first so you can get a better idea on which South Tyrolean castles pique your interest the most. Reaching Trostburg Castle requires a long hike up a cobbled path, but all who make it are rewarded with awe-inspiring sights stretching across the Valle Isarco. When walking along an ancient water channel carved into the steep mountainside, it’s easy to lose your breath at the sight Castle Lebenberg. The castle suddenly greets you from its perch after rounding a corner shrouded in grape vines. It vigilantly stands guard amidst rolling vineyards over the valley below. The Lords of Marlengo constructed this elegant fortress in the 13th century. Castle Lebenberg fascinates visitors with its late Gothic chapel adorned in precious frescoes from the 14th century. The castle’s walls also hold a Hall of Mirrors and Hall of Knights that is complete with a collection of medieval weapons worth marveling at. Visitors can also explore an ornate French flower garden and inner courtyards straight out of a fable. 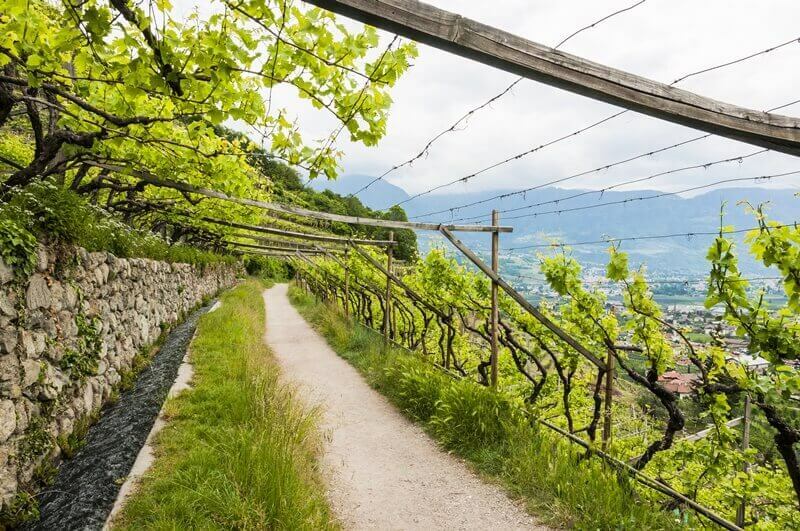 The hike to Lebenberg Castle leads you through some of the most vibrant vineyards in South Tyrol. The most picturesque way to reach Castle Lebenberg is by hiking the Marlengo waalweg. 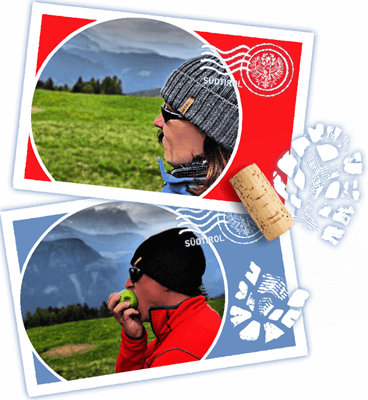 From this trail, you’ll wander through forests, vineyards and orchards all while consuming the lushness of Merano and the surrounding mountains. A perfect way to spend a day in South Tyrol. Erected more than 800 years ago, the Prösels Castle is a magnificent fortress with a haunting history. The castle sits in the shadow of Schlern mountain and in the 16th century was the site of witch trials, which resulted in the burning of dozens of women at the stake. Despite its tragic past, the castle now serves as a place of celebration hosting many events and concerts. Its stark beauty against the rolling countryside leaves an impression you will not be quick to forget no matter the season you visit. Prösels Castle is a haunting fortress in more ways than one. Long ago, it was once the scene of several witch trials. As much as Castle Taufers looks it belongs in Game of Thrones, it’s Churburg Castle that could be the inspiration for the swords, lances and armor of Westeros. For the last 500 years, Churburg Castle has remained within the same family and holds the largest collection of medieval armor in the world. With 50 authentic suits of armor and accompanying weapons, one can only imagine the intense battles that were once fought to keep its arcaded courtyard with its two stories of frescoes fully-protected and remarkably-preserved to this day. The Churburg Castle is a feast for those drawn to the military history of Europe. Churburg Castle remains battle ready with the largest assortment of medieval weaponry in the world. With 800 plus castles to pick from on any given visit to South Tyrol, you’re sure to find one you would love to call home. Even South Tyrol’s castle ruins look enticing to live in amidst the expansive romantic backdrop of mountains, vineyards and orchards. This list of castles to see in South Tyrol is obviously by no means exhaustive. But we hope you now have a sense for the medieval splendor awaiting your exploration. Too many travelers are not aware of the striking architecture and history lying in the far north of Italy. We’ll leave with a word of caution to those that favor the couch over a trail. Getting to many of these magnificent structures can be challenging. Many cling to mountainsides requiring hikes up steep trails and rugged paths. By the time you get to the top, you’ll know if you were cut out to be a knight. But worry not. The view from a mountain-born castle always quickly washes away any memory of the trek up. Always. We guarantee it. What an amazing post and pictures – didn’t know about this region and now I can’t wait to visit! Thank you! This is such a cool post! I love how you give the historical background of all the castles. I’ll definitely be visiting sometime soon! Totally agree with you all of these pictures are Instagram perfect captures. And when I try to choose any one of the castle, I couldn’t. Amazing to know that how there is so much in the kitty of mother nature a person cant touch in a lifetime. Awesome post. These castles reflect our richest tradition and culture. 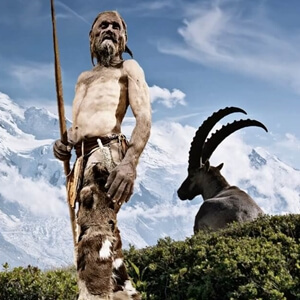 No doubt, it will be an unforgettable journey for the travelers as well as historians. I am impressed with the beauty of the surrounding location and nature. Wow! Some of them have such incredible backdrops against the castles, I’m in love with the photos! Wow. Looks like this castles from old German fairytales that my grandma used to read to me when I was young 🙂 I would love to see them one day. Looks so nice. Thank you for sharing. I love chasing castles. These are so much coming on my list! I can’t get over how many there are! And those pictures are incredibly stunning!! 800+ castles? That’s incredible! I like how you have drawn comparison to Game of Thrones 😉 Out of the ones you have listed, Prösels Castle and Castle Taufers look fantastic and I would love to visit them. The hike sounds cool too. How amazing that there are so many castles to visit here! I definitely want to make it here and see it all. As a history teacher, this is right up my alley! What a lovely list of castles! So fairytale like! Absolutely stunning – the castles definitely look like they’d be featured in GoT. I’ve been to Italy but never made it up that far North…looks like I have to plan a return soon – cannot decide if castle hopping would be better in the spring or winter! Wow! All of these castles are breath taking! Your photography is impeccable! Oh my goodness, these castles are amazing! (And the landscapes surrounding them aren’t too shabby either.) You did such a good job photographing them! 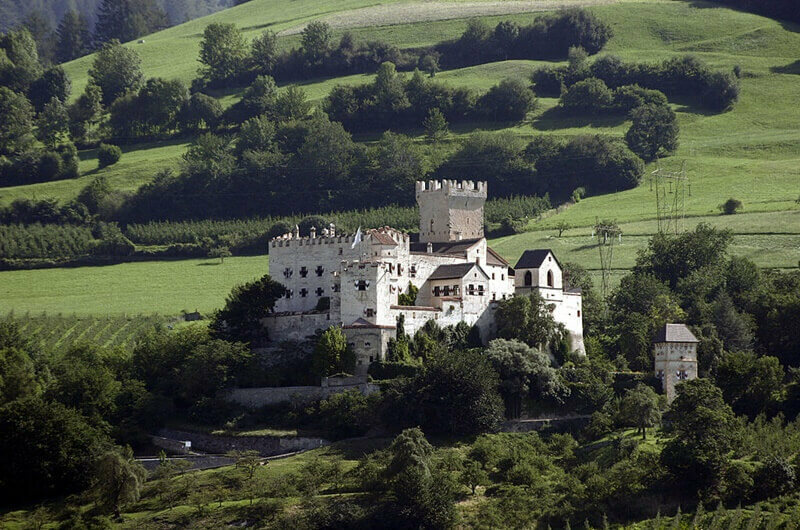 I can’t believe South Tyrol has 800 castles – that’s incredible! The castles look so beautiful set against the alps. I love visiting castles and pretending what it would be like to be a princess living in a big castle. ?? These castles are so cool! Amazing photos as well! I’d love to do a castle tour of the South Tyrol (and many other regions too ;)! Thank you for writing such a detailed overview of castles in South Tyrol. They are all absolutely spectacular. I want to visit them all! Wauw how beautiful are those castles!! We always visited them when I was little, but didn’t appreciate them that much yet (I hated the hikes up there). But now I’m reading your blog it looks amazing! Definitely gonna save your recommendations for my next trip to Italy! My jaw just kept dropping all through this post… every one of these castles is amazing and I can’t believe how many there! Thanks so much! We barely scratched the surface of all the castles in South Tyrol. Keep an eye out for more. oh my gosh! These pictures are stunning! This looks like an experience of a lifetime! Wow! I love the castles. My first castle was last year and now I want to visit more. Really enjoyed this post! As a fan of fantasy-fiction, I’ve always dreamed of spending a night in a castle like these. I absolutely have the same dream! I am awestruck reading your post! What amazing photos and castles! I love the idea of hiking up to view/tour them too! !